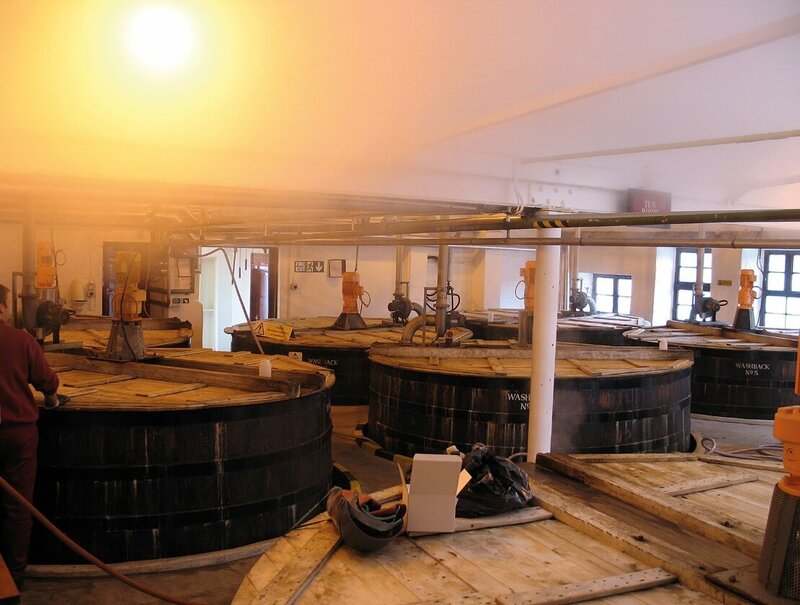 Primary conversion occurs in the mash tun and accounts for 75-80 per cent of the total process, while secondary conversion takes place in the wash back and refers to the remaining 20 to 25 per cent. 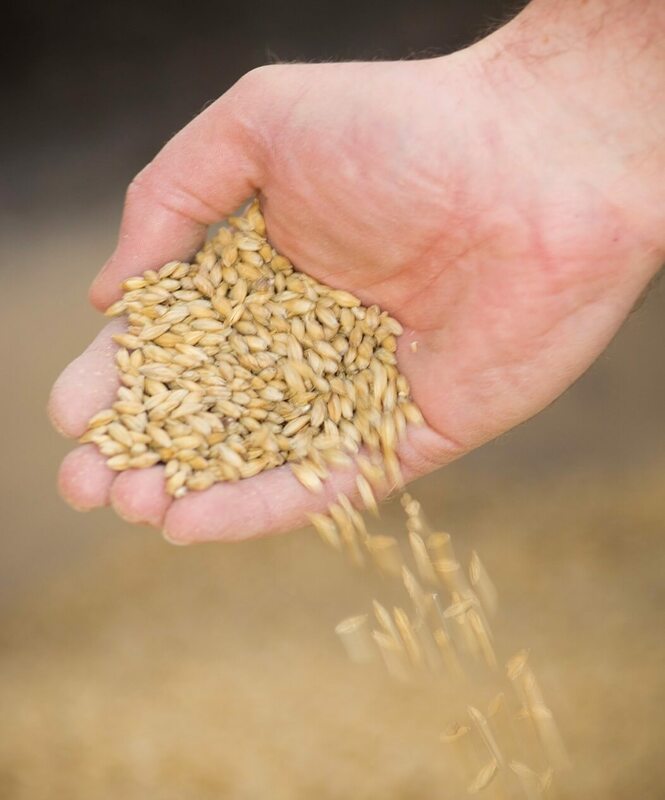 Successful conversion is vital to maximise the yield of alcohol, and depends (essentially) on the actions of three key enzymes present in the barley. Each enzyme has a separate role and modus operandi, which adds up to amazing team-work. Two of these enzymes, alpha amylase and beta amylase, start working in the mash tun and continue in the washback, whereas the third key enzyme, limit dextrinase, gets going in the washback. Mashing begins with the grist (ie. milled barley) being combined with hot water at 63.5 degrees centigrade. Enzymes are heat sensitive and active/inactive within different temperature ranges, with 63.5 degrees centigrade a ‘compromise’ temperature that enables alpha amylase and beta amylase to be active (though alpha amylase performs better at a higher temperature, while beta amylase prefers it cooler). The heat of the water also solubilises (dissolves) the starch within the grist, and once this happens both enzymes can start working. Grist contains numerous ‘pockets’ of starch, with each pocket containing a chain of linked starch units. Each chain can extend to several thousand units, and could be compared to a ball of string (ie. a single piece of string wrapped around itself). Alpha amylase is the swashbuckling enzyme, often referred to as a machete, hacking these ‘balls of string’ in half, then chopping each half in two, and so on. Beta amylase can only chop off starch units which are at the end of a chain, but can’t chop any units along the length of the chain. So, every time alpha amylase hacks away, this creates additional ‘ends’ for beta amylase to chop off. Beta amylase is far more precise, effectively a pair of scissors cutting off two linked units at a time, as it continues along a chain. This chopping process by both enzymes simultaneously converts the starches into various sugars, classified according to the number of linked glucose units. Mashing results primarily in maltose (two linked units), and as beta amylase can’t get around to cutting every starch chain into units of two, there’s also some glucose (one unit) and maltotriose (three linked units). Alpha amylase and beta amylase deal very effectively with starch chains that are the equivalent of a long piece of string. However, there is another type of starch chain that has additional chains coming off it, like branches, and alpha amylase and beta amylase become inactive when reaching the junction of a chain and a branch. This is where limit dextrinase comes to the rescue, by chopping off branches from a chain. Alpha amylase can then hack these broken off branches into smaller lengths, creating more single chains with ‘ends’ that beta amylase can cut. During mashing the temperature is too high for limit dextrinase, which only becomes active in the wash back when the temperature is lower. This cooling down is the result of conducting the wort (ie. sugary liquid) from the mash tun to a heat exchanger, which utilises the heat of the wort to increase the temperature of the charge, ie. liquid about to be distilled (see WM 143). “Wort enters the heat exchanger from around 61 degrees centigrade, and leaves at around 16-20 degrees centigrade, from where it is conducted to the washback,” says Stuart Robertson, Dalmore’s distillery manager. Consequently, all three enzymes are at work together during secondary conversion. But how do enzymes chop up starch chains? “An enzyme has the appearance of a tangled ball of wool, but within that tangle is a specially shaped cavity that can accommodate the shape of the starch chain, like two pieces of a jigsaw interlocking, and this physical contact is sufficient to break the starch chain, and result in the starch being converted to sugar,” says John Ross, technical area leader, William Grant & Sons. Meanwhile, yeast is added to the washback to begin fermentation. Depending on the distillery fermentation can take from around 48-100 hours, with secondary conversion typically ending after 24 hours. This is because the liquid being fermented becomes increasingly acidic, which in turn makes the enzymes increasingly inactive. But by then their work is done, having provided the yeast with sugars to feed on. “By the end of fermentation around 85 to 87 per cent of the original starch level is converted and turned into alcohol, this is about the maximum we can achieve. The residual 13-15 per cent contains starches and other material which can’t be converted by the enzymes,” says Jim Simpson, production control manager, Chivas Brothers. “If the temperature of the mash is hotter, or cooler, than the optimum of 63.5 to 64 degrees centigrade it can compromise the process efficiency and yield. We may take samples of wort to measure conversion should things vary from the norm, but most of the time it all goes very smoothly,” says Stuart Robertson, Dalmore’s distillery manager. So, what are the potential consequences of the process not quite going to plan? a slightly lower alcoholic strength than usual. But this wouldn’t require any adjustments to the distillation regime in order to maintain the usual spirit character,” says Brendan McCarron, head of maturing whisky stocks, Glenmorangie.